Reverend Michael J. Burbeck, Parochial Vicar at St. Mark Catholic Church, talks with Carolina Catholic about St. John Paul II's Theology of the Body which is a term used to describe a series of talks given by St. John Paul II from 1979 to 1984 on the topic of his integrated vision of the human person. These talks, often referred to as "Human Love in the Divine Plan," beautifully describe St. John Paul II's teaching on love, life, and human sexuality. His reflections are based on Scripture and contain a vision of the human person truly worthy of man. In this show, Father will also discuss how Natural Family Planning respects and works with the theology of our bodies. Fr. Michael was born in Stanford, CA on May 2, 1984 to Stephen and Christina Burbeck. His family moved to North Carolina when he was five years old, and he grew up in Apex. He was baptized in Penny Road Church of the Nazarene at the age of ten and attended that church for several years before growing dissatisfied with it. Following a profound conversion experience while traveling in Europe, he was received into full communion with the Catholic Church at the Easter Vigil in 2003 at St. Michael the Archangel Catholic Church in Cary. Following some time away from school, Father attended North Carolina State University and graduated with a B.S. in Economics in 2006. While there, he was involved with the Newman Center where he became further convinced that God was calling him to the priesthood. After being accepted as a seminarian for the Diocese of Raleigh, he did a pastoral year at St. Ann’s in Clayton and then entered St. Charles Borromeo Seminary in Philadelphia in 2007. While at the seminary, Father developed a love for sacred music and Liturgy, first singing in and then directing one of the seminary choirs. 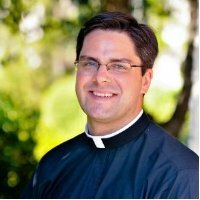 As a seminarian, he was assigned at Saint Anthony of Padua in Southern Pines, Immaculate Conception in Clinton, and here at Saint Mark. He also spent a spirituality year in residence at Our Lady of Guadalupe in Newton Grove with Fr. Pat Keane, two months in Guatemala and Honduras for Spanish immersion and missionary work, and two summers of intensive spiritual formation at the Institute for Priestly Formation in Omaha, NE. Father has an older brother who lives in England with his wife and two children, and his parents split their time between their homes in Carolina Beach and England. In his free time, Father Michael enjoys music and the arts, reading, the outdoors, horseback riding and the occasional game of basketball or round of golf. His interests are the spirituality of St. Ignatius of Loyola, Sacred Liturgy, Canon Law, and theology and spirituality in general. What is “Theology of the Body?" It is 129 catechesis given at Wednesday General Audiences from 1979-1984 plus 6 more that were written but not delivered in public that treat the Song of Songs and Book of Tobit. The cycle was interrupted on May 13th 1981 by the assassination attempt and again in 1983 for a special holy year. Why is it called “Theology of the Body?" The original manuscript was published with the title “Man and Woman He Created Them”. But he described the work as “reflections on the theology of the body”, which is the name that has stuck in English. The human person, especially human sexuality. Called theology of the body because he is fighting against a common view point that regards the human person as primarily spiritual, as if the body were incidental or merely a tool to be manipulated. JP II’s proposal instead is that the body is integral to the human person and that it actual helps reveal to us the mystery of the human person and human sexuality.